Walk into any bank across the federation and make payment on E-Transact platform to purchase Graduate School application form for 2017/2018 academic session. Make a payment of ₦15,000.00 and obtain the payment slip. Log on with the generated pin on the payment slip to fill the Postgraduate form. While Saturday 21st October 2017 is for Masters and Ph.D candidates. The website for submission of application will be shut down on Friday 8th October,2017. Part B – Oral interview in the respective departments based on subject area/concept note for Ph.D and Master’s candidates. There shall be No oral interview for MBA, MPAS and all PGD programmes. Also call the number on the last page of the Faculty publication for inquiry. All calls must be between 9.00 a.m. and 4.00 p.m. Applications are invited from suitably qualified candidates for admission into graduate programmes in the 2017/2018 academic year leading to the award of Postgraduate Diploma, Masters and Doctor of Philosophy Degree of the University of Calabar. Courses may be offered full-time or part-time. All programmes begin with coursework and end with a project for Graduate Diploma, MBA, MPA and MPAS or thesis for Master’s and Ph.D degrees. Duration of Programme: For full-time studies the Postgraduate Diploma lasts for two (2) semesters. The Master’s degrees last for 4 semesters; and the Doctor of Philosophy (Ph.D) programmes last for 6 semesters. For part-time programmes, the Master’s degrees last for 6 semesters, the Doctor of Philosophy (Ph.D) lasts for 10 semesters. Note that PGD programmes run on full-time basis only. Requirements for Admission: Candidates are required to have a minimum CGPA of 3.00 on a 5-point scale and 2.75 on a 4-point scale for Master’s programmes and 4.00 on a 5-point scale and 3.00 on a 4-point scale for the Ph.D programmes. A CGPA of 1.50 and above is required for PGD programmes. Candidates with Master’s degree from recognized universities may credit the relevant courses towards the Ph.D programme, provided that the quality of the grade is acceptable to the Graduate School. Note: Filling of forms – Surnames first, First name next, Middle name last. There will be no changes made after submission of application forms online. Therefore candidates must think through before submission as any change will attract a fee. This is to prevent multiple applications. The titles Mr, Miss or Mrs may be used but not Rev(Dr), Chief, etc. Programmes applied for should be Ph.D, M.A, M.Ed, M.Sc, MPH, LLM, and PGD. No extension of application after 8th of October, 2017. The website will be shut down on October 8, 2017. Interested candidates are to first log on to our website: www.unicalonline.edu.ng or click here to access and download the prospectus for the complete description of available courses. Thereafter, candidates are required to pay a non-refundable fee of ₦15,000.00 at any bank nationwide via E-Transact platform for Graduate School application form 2017/2018 academic session. A printout with a unique pin will be issued at the bank. Candidates will then enter their unique PIN and their mobile phone numbers on www.unicalonline.edu.ng/admissions to access the form. Follow the steps by providing your data as prompted and ensure that your form is submitted. YOU ARE TO PRINT OUT A COPY OF YOUR FORM AND CONCEPT NOTE, BY CLICKING ON PRINT button after submission. Please bring a copy of the printed form to the venue on the day of the screening. As part of the application, candidates are expected to submit a CONCEPT NOTE of 2 pages maximum for Ph.D programmes and one (1) page maximum for Master’s programmes. Note: Candidates who fail to send their concept notes online along with their application forms will not be allowed to take part in the oral interview. Candidates are to ensure that their academic transcripts are forwarded by their previous institutions through courier service to the Academic Secretary, Graduate School, University of Calabar, P.M.B. 1115, Calabar, Cross River State, ON OR BEFORE THE DEADLINE INDICATED BELOW. ALL TRANSCRIPTS MUST BE RECEIVED IN GRADUATE SCHOOL ON OR BEFORE THE SCREENING DAY being OCTOBER 20, 2017. Candidates whose transcripts are not received in the Graduate School by OCTOBER 20, 2017, shall NOT BE CONSIDERED FOR ADMISSION. There will be no room for awaiting results (all applicants whose results have not been approved by the Graduate School Board/University Senate will not be considered for admission). The website for submission of application will be shut down on the 8th October, 2017. Programmes leading to the award of Postgraduate Diploma, Master’s, and Ph.D degrees are available in the under-listed Departments. Agricultural Economics, Agricultural Extension and Rural Sociology, Animal Science; Crop Science; Soil Science; Forestry and Wildlife Resource Management. Medical Laboratory Science (Medical Microbiology/ Parasitology Unit, Chemical Pathology Unit, Histophathology Unit and Haematology Unit), Radiography and Radiological Sciences, Nursing Sciences. English and Literary Studies; History and International Studies; Linguistics and Communication Studies; Religious and Cultural Studies; Philosophy; Theatre and Media Studies; Modern Languages and Translation Studies. Botany, Genetics & Biotechnology, Microbiology, Zoology and Environmental Biology. Arts Education; Business Education; Continuing Education and Development Studies; Curriculum and Teaching; Educational Administration and Planning; Educational Foundations, Guidance and Counselling; Environmental Education; Library and Information Science; Science Education; Social Science Education; Special Education. Accounting, Banking and Finance; Business Management; Marketing. Medicine and Dentistry; Community Medicine. Geology; Mathematics; Statistics; Computer Science; Physics; Pure and Applied Chemistry. Economics; Geography and Environmental Science; Political Science; Sociology; Public Administration. The management of Edo University, Iyamho, Etsako West Local Government Area, Edo State, has dissociated itself from online and mainstream media reports with the headlines “Edo Owned University not for the poor,” and “VC says Edo University not for poor Nigerians”. A statement signed by the school’s Registrar, Dr. Mrs. Isoken Ogboro, indicated that at no point in time did the Acting Vice Chancellor, either expressly or impliedly made a statement that could be conjured in the manner of the headlines in the misleading reports. “We do not therefore agree with those headlines and consequently view those captions as sensational and calculated attempt to tarnish the good image of the university. “It is our submission that these headlines are misinformed, misguided as regards its mission of providing quality education to all classes of Nigerians “, according to the statement. The statement described the University as one envisioned to provide quality education geared towards the socio-economic, political and technological advancements of the Nigerian state and indeed the world, irrespective of social class. The university averred that the misleading reports may have been initiated by people motivated by partisan hegemonistic interest who found it appropriate to use the media as instruments to push them through. It therefore condemned in strong terms any allegation or misinformation, either published on the pages of newspapers or orally spread by any person or group of persons to tarnish the good image of the Acting Vice Chancellor and the University. It urged the reading public, both online and of-line to disregard the misleading reports, just as it assured the general public that the acting VC would continue in his good works and not allow those it called “disgruntled elements” to distract him from his avowed desire to run and position Edo University, Iyamho as one of the Ivy League universities in Nigeria and globally. 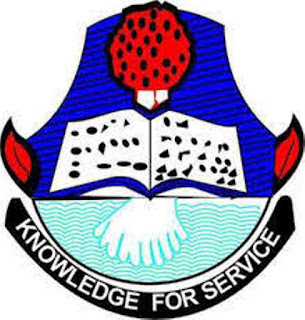 Candidates who made Akwa Ibom State University their choice of institution in the ongoing Jamb Direct Entry registration are directed on successful completion of their registration to visit the main campus in Ikot Akpaden, Mkpat Enin L.G.A to submit the following listed documents as required by the institution. (i) Jamb Direct Entry Registration slip showing candidates passport. (ii) O’Level result [of not more than two sittings]. (iii) Certificate of National Diploma from previously attended Institution. (iv) Transcript of academic results from previously attended Institution. (v) Birth certificate (or Affidavit equivalent). These documents should be submitted to the school' registry at Ikot-Akpaden and submitted in two photocopies for each document. And its applicable for only DIRECT ENTRY CANDIDATES WHO MADE AKSU AS THEIR CHOICE OF INSTITUITION in Jamb 2017 Direct entry registration. The Adeyemi Federal University of Education, AFUED, which was sometimes put on hold in August 2015 after the public announcement by the immediate past President of Nigeria, Goodluck Jonathan, has today received a full sigh of hope for reversal of the status. This hope came alive as the Adeyemi University bill and its establishment, named SB 399, was successfully passed unhindered at the Senate committee on Tertiary Institutions and TETFund. In his own remark while declaring the public hearing opened, the Senate president, ably represented by the Deputy chief whip of the house, Senator Francis Alanumeta, a distinguished senator from Edo state, said that the bill, which came along side other bills in the same line, seeking establishments of Federal universities of Kano, Owerri and Zaria, named SB 397, 398 &400 alongside the bill seeking the upgrading of FederalCollege of Agriculture Kabba to a University of Agriculture, is a bill that the Senate supports as the affected Colleges of Education already have existing facilities both human and materials for a successful take off such that the federal government will have less to spend in this time of economic recession. Meanwhile, in his address of welcome, the chairman Senate committee on tertiary education, Senator Jubril Barau, assured the audience that all opinions on the matter for discussion will be heard, irrespective of the perspective. He further stated that the minority will always have their say while the majority will in turn have their way. After the public hearing, it was indeed jubilation galore for the representatives of the four age long colleges of education whose respective bills on the upgrade to federal universities of education did not receive canter memorandum. It is therefore hoped that very soon, the Senate committee report will be ratified by the house and consequently sent to the president for executive approval and sign-in to law. It would be recalled that earlier in 2016, the respective bills have equally sailed through the processes in the green chamber. Earlier, the presence of Senator Dino Melaye to the conference hall witnessed a loud ovation being one of the sponsors of the bills under consideration and also acknowledged as one the highly profiled senator of the federal republic of Nigeria with the highest number of sponsored bills. 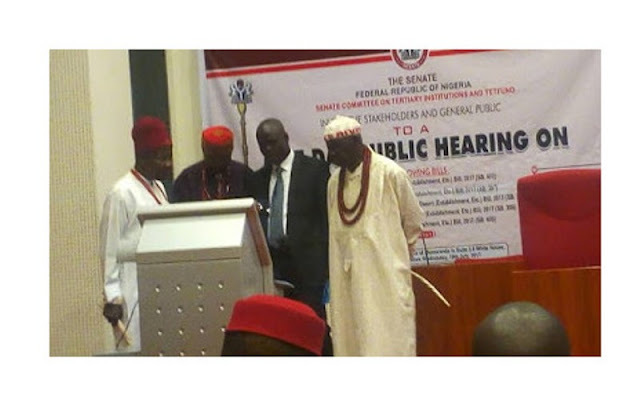 While addressing the August gathering, Melaye in his usual dynamic manner, pulled his weight behind the bill and dramatically affirmed that he would even go spiritual, beyond being political in seeing the successful signing of the proposed bill into law. Leading the delegation of the College to the red chamber is the College Provost, Prof Olukoya Ogen, accompanied by the eminent Council chairman, Prof Nathaniel Ohazurike and Dr. Folorunso Balogun who equally lend their voices in support of the bill through their memorandum. Also present are the representatives of the paramount ruler of Ondo kingdom, the Lisa and Sasere of the kingdom, who both, through their paper presentation affirmed that the reversal of the Adeyemi University which was put on hold will certainly restore the joy of Ondo kingdom. Applications are invited from suitably qualified candidates for admission into the following programmes offered at the Federal Polytechnic, Idah, Kogi State for the 2017/2018Academic Session. The National Diploma in the relevant field with a minimum of Lower Credit grade obtained from a recognized Institution, and a minimum of one-year post qualification experience. In exceptional cases, candidates with pass grade and a minimum of two years post qualification experience in the specific field maybe considered for admission. In addition, candidates must possess Five (5) relevant credit passes, including Mathematics and English Language at the SSCE, GCE, NECO, NABTEB and other O/L equivalent qualifications obtained at not more than two (2) sittings. All candidates including ND graduates from Federal Polytechnic Idah are to upload their results and forward same with their academic transcripts and confidential report to the Registrar for admission purposes. DURATION: Two Academic Sessions of Four semesters. The National Diploma in the relevant field with a minimum of Lower Credit grade obtained from a recognized Institution, and a minimum of one-year post qualification experience. In exceptional cases, candidates with pass grade and a minimum of two years post qualification experience in the specific field may be considered for admission. C. All candidates including ND graduates from Federal Polytechnic Idah are to upload their results and forward same with their academic transcripts and confidential report to the Registrar for admission purposes. ENTRY REQUIREMENTS FOR ND PROGRAMMES: Five (5) relevant credit passes, including Mathematics and English Language at the SSCE, GCE, NECCO, NABTEB and other O/L equivalent qualifications obtained at not more than 2 sittings. The entry requirements are, at least five (5) Ordinary Level passes or their equivalents, including Mathematics and English Language, at NOT more than two sittings obtained from WAEC, NECO and NABTEB in subjects relevant to the programmes. Take the printed Payment Invoice to any Bank for the payment of Five Thousand, Five Hundred Naira (N5,500.00) only using the Remita. CLOSING DATE: The closing date for the application is september 25th, 2017. All Screening exercises for the HND and Remedial candidates will take place at the Federal Polytechnic, Idah and on a date to be announced later. 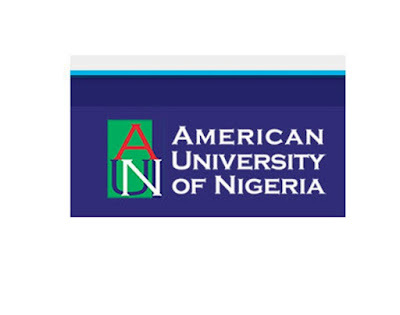 Continuing its tradition of attracting the brightest students from throughout Nigeria and Africa, the American University of Nigeria will offer 75 merit scholarships to already accepted candidates in the 2017 fall semester. The highly competitive computer-based examination for the scholarships will take place in 25 centers across the Federation on August 5. Assistant VP of Recruitment & Marketing, Julius AyukTabe, said the examination centers have been carefully selected to cover all the nation’s six geopolitical zones. Two scholarship winners will emerge from each of the nation’s 36 states and the Federal Capital territory, and one nationwide. Last spring’s nationwide winner was 18-year-old Ms. Maryam Habila Usman, a former student of Air Force Girls Secondary School, Jos. Ms. Usman is from Borno State. She is in the Natural and Environmental Sciences program. Since its founding in 2003 by former Nigerian Vice President, HE Atiku Abubakar, AUN has been bringing together the best and brightest candidates from all over Nigeria, South Africa, Cameroon, Ghana, Uganda, Rwanda, Ivory Coast, Niger, Chad, Sierra Leone, and other African countries, to study under one roof. The University seeks to make its American-style liberal education possible for all qualified applicants, regardless of family income. Each year, AUN sets aside a large fund for scholarships and other forms of financial aid to undergraduate students. Over the years, it has awarded about 1,000 different scholarships, including close to 300 covering full tuition, board, books, and meals. In the 2016/2017 session alone, AUN dedicated more than ₦102 million to its scholarship program, for both new and returning students. Scholarship students are often among the finest of AUN’s graduates. The University’s Class of 2017 Valedictorian, Ms. Onyinye Immaculata Onuigbo, whose 3.98 CGA (out of 4 points) was the highest in the university’s history, was a scholarship student. Identified by the Shehu Musa Yar’Adua Foundation, Ms. Onuigbo, who hails from Enugu State, is the daughter of an electrician father and nurse mother. She completed her studies at AUN in its prestigious Petroleum Chemistry program. 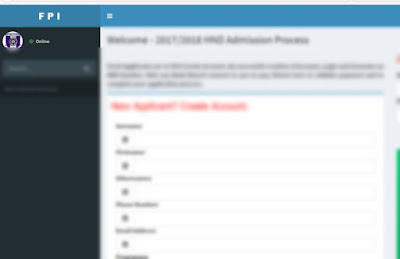 Candidates are referred to the University’s website – www.aun.edu.ng - for further details on how to apply. © Copyright 2017 School News, Admissions, JAMB News, Nigeria Universities, Polytechnics and Colleges News.Brown James Powered by AcademicsNG.